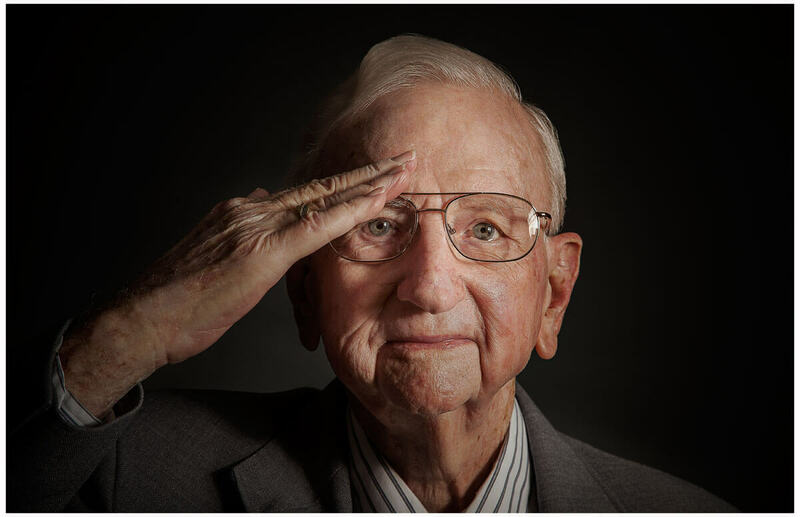 Photographer Dennis Burnett, located in Austin, TX, takes portraits of WWII veterans. I served in WWII, stayed in the Reserves, then went back in the ’60s to Vietnam. I think the difference between those wars was in WWII we felt we had an objective — we needed to win and claim our country. I don’t think we knew what we were doing in Vietnam, and you didn’t know who the enemy was. I recall working on the highways during the day with the locals, and then overnight the ditches would all be filled up. I got lots of medals, but never a Purple Heart, and I have outlived almost everyone I served with. I sometimes joke that I won’t know any of my pallbearers. My most important life lesson has been to be honest in all your dealing; I taught my children that even if you have trouble explaining why, always be honest.